I bough the latest version of Corel Graphics Suite, the two main products it contains are CorelDraw and Corel Photo-Paint, both version 9. They definitely made a huge progress even compare to version 8, that I had before (yet did not used much), not to mention version 5, which I used before I really switch to PhotoShop 3. I think that Corel's programs achieved a high quality level, have all the important features and 10,000 free goodies, BUT they are designed for engineers and not for artists and designers. However, despite all the inconveniences they have I will be forcing myself to use them more, just to master it. 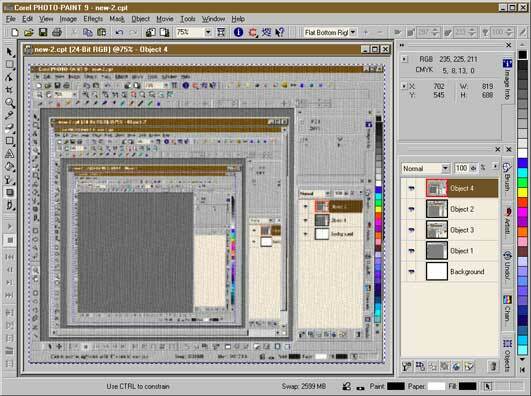 I think, that Corel will release their graphic suite for the Linux platform way before Adobe. So in order to shift the balance of use of Linux vs. NT, I will have to do more work on Linux, and that's when mastering PhotoPaint and CorelDraw will start paying back.